Honda Motorcycle & Scooter India Pvt. Ltd. today inaugurated the 2nd assembly line of its landmark fourth manufacturing plant at Vithalapur (Mandal taluk, Ahmedabad district) in the western state of Gujarat. 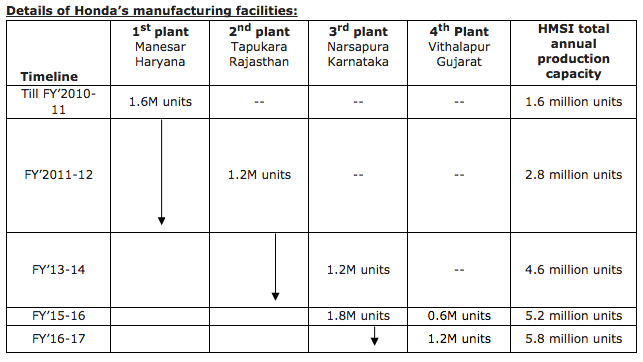 Adding an additional 6 lac units annual production capacity, the 4th plant’s total capacity has now reached 1.2 million units annually. The second assembly line inaugurated today is an exclusive scooter assembly line and will produce India’s largest selling two-wheeler Activa. India is not only the World’s No. 1 two-wheeler market but is also going to be the No. 1 contributor to Honda global 2Wheeler sales for the first time in this fiscal year 2016-17. Scooterization, a trend seen earlier in developed markets of the world, is firmly driving the Indian 2Wheeler momentum today. The scooter segment is growing at 30% compared to 15% growth of two-wheeler industry. Today, Honda is leading the Scooterization of India with a 58% market share. The new 2nd assembly line addition further supports Honda in cementing its undisputed leadership in scooter segment. Ending the 17 year old monopoly of motorcycle, Honda’s iconic automatic scooter ACTIVA is now the new India’s largest selling 2Wheeler in 2016.